Healthy Loser Gal: Review: Eucerin Everyday Protection Body & Face Lotions = Fab After 50! Review: Eucerin Everyday Protection Body & Face Lotions = Fab After 50! Talk about your Law of Attraction and something unexpected arriving just when you need it - - look what I received from Eucerin! The very first week of June I headed oh-solo-mio to Hampton Beach, NH (actually I ended up there, I didn't really head there...) and had the beach nearly to myself so lounged and read and snoozed and walked and spent hours and hours there. In the sun. Without adequate sunscreen. Can we say "ouch!" 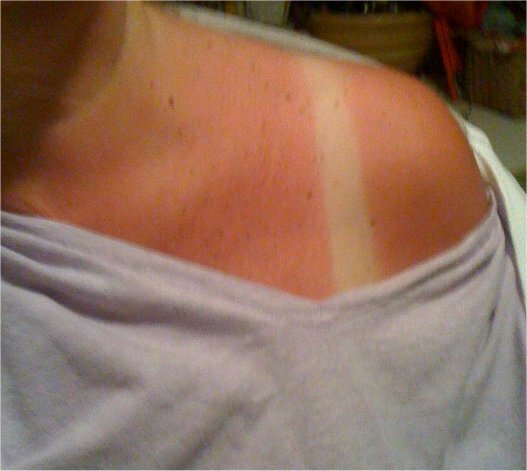 from sunburn?! Aloe helped and I slathered on skin moisturizing lotion twice a day, but - sadly - I have found that 50 year old skin does not "bounce back" with the elasticity of 20 year old or even 30 year old skin, so I was still peeling a little bit and kind of scaly... AND I had my 35th high school reunion approaching. I really didn't want to go looking "leathery". Enter the Boston Health & Fitness Expo. At the Expo I had visited the Eucerin exhibit and tried samples of their new Everyday Protection line and was startled then by how quickly it absorbed into my skin and didn't feel greasy. I've been a Eucerin fan since I began using it maybe 10 years ago to solve my rough elbows and heels problem, so knew their products were good. Within 36 hours of the Expo and less than 72 hours of leaving on vacation for my informal class reunion, I received an email asking me if I'd like to receive and review Eucerin Everyday Protection lotions for the blog. YES! The products arrived two days later in a cute little gift bag and, to my delight, I began to use both the 30 SPF Everyday Protection Face Lotion and the 15 SPF Everyday Protection Body Lotion. 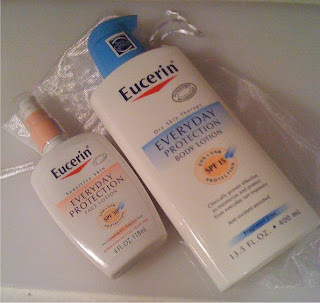 I *LOVE* the Eucerin Everyday Protection Body Lotion! I have used one body moisturizer for years and keep going back to it (St. Ives' Oatmeal) because it is so light and absorbs quickly but it wasn't helping out my skin with the damage I did from the sunburn. The Eucerin Everyday Protection Body Lotion showed visible change right away. Additionally - and this is huge for someone like me because I am not good about putting both moisturizer and sun block on before I head out the door to walk or ride bike - now there is one step and I know I'm protected and don't have to 'seek the shade' worried about my shoulders and arms getting burned. What is more, the damage I did to my skin was dramatically improved by this product! I'm thankful to Eucerin for reaching out to ask me to review their product but I'm grateful for the excellent product that will continue as part of my daily skincare regimen. Your products are helping me be "Fab After Fifty"! Life is good! Anyway, it's a good combo. I use Eucerin now for a hand lotion. I had no idea the had face lotions as well, I'd never looked. I'm so sorry I missed the Boston fitbloggin' expo. I didn't find out about it until it was too late! Maybe next year!